Vicky's Moskitos #13 is being presented the 14th of march 2007 simultaneously in Second Life and at the Art.Think.Box Netherbeck, performed by the Avatar Orchestra Metaverse and at the Waag Society Amsterdam, presented and performed by ookoi. 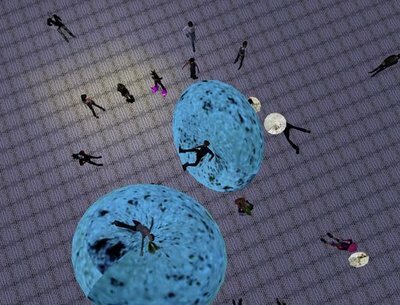 The Second Life performance was screened and sounded live to the audience at Waag. ‘Fadheit’ is properly called "Variationen über die Fadheit Nr. 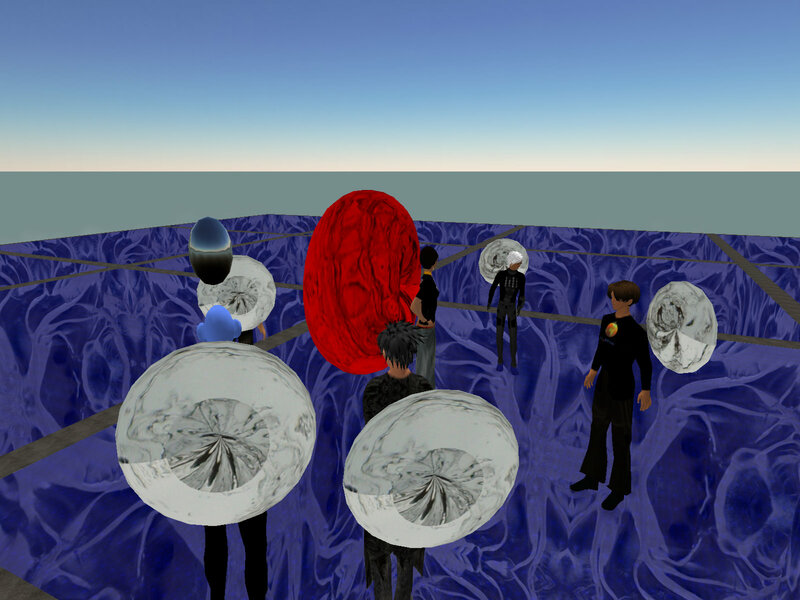 2 – für Avatar Orchestra Metaverse" is a piece of soundart, that existed before in RL. 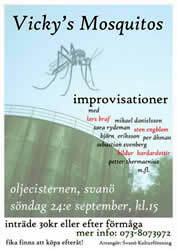 Based on a Soloversion for a Laptop (Supercollider 3) the composition was played also by Laptoporchester Berlin. The german word "fadheit" means something like staleness. The composition deals with elementar sounds of a violin and tries to explore elementally these sounds. Which produces a somehow stale environment. In East-Asia (China, Korea, Japan) staleness is often also positivly denoted. Fadheit is then the reduction of the basic things and of the crucial and essential moments. The name of the piece is inspired by the book ‘Le vol d´Icare’ by Raymond Queneau. Icare is the main character of the author character in this novel Le vol d´Ícare. One day he disappears from his author and this is the frame of this story. The character Icare did not want to be locked inside the story of the author and when suddenly he gets free he explores a new world. Icare finds himself on a zero point and that is the street called Rue Blanche. Icare seems to enjoy this and he from there he explores the new life. Things he has not been able to do before. He feels very free and with lust for life. He also falls in love to with LN. The link i did with this piece Rue Blanche is as follows. I was reading this book during spring 2007. The different planes of being, like characters, avatars, stories in different planes and the connection them between inspired me much. So Rue Blanche is a metaphor for a new perspective with lots of possibilities to play together with different avatars and them making sounds and movements within this piece of Rue Blanche. So thus i wanted to explore in this newborn context of Avatar Orchestra Metaverse. There are two groups of players in the piece, the sinus players that plays the sine tones only and the cosinus players that plays additional field recordings or other found sounds and beating and sweeping sine tones. The HUDs (which emit the sounds, but are invisible to the audience) are supplemented by receivers that are worn on the back of avatars and are becoming red when a sound is played, visualizing the musicians playing. Rue Blanche was made as an experiment to work with sine tones in harmonic series in an orchestral context. A sine tone is the most simple and pure waveform consisting of only one frequency. A harmonic series is a progression of tones with start from the fundamental tone frequency and then 2, 3, 4, 5, 6 times the fundamental frequency. The HUDs was prepared with two sets of sine tone harmonic series. In addition to the sine tones the piece includes found sounds or field recordings. The Onomatophone was created out of the idea to build an instrument with rean 3-dimensional sound. The result is an instrumnt that separates the control-interface from the sound-generation: six spheres sending out audio fly right through the audience, thus giving everybody a unique, continuously changing mix. W.N.K. is not only a song I made for AOM but also a proof of concept that loop-based/rhythm-oriented music can be arranged/performed/mixed live in SL. Hence the dance/Drum'nBass loops. I simply wanted to see if they play back in sync in laggy live situations. These drum-loops are taken from the web or were freebies from synthesizer magazines; of course I processed them and did not use them unedited. The other loops were (like the rest of the samples used here) created from my library of field-recordings: There are, for examples the heating of a flat I once lived in for a while, a metal lid covering the public water-systems at the place we go to for flying kites and riding sleigh, the mouse-clicks of my old Atari and so on. Technically, it as a project for learning the coding of LSL (Linden Scrpting Language), I had to create an interface controlling the sounds as well as the movements of the spheres - plus visual feedback for the audience (and player) as the buttons change color when clicked. After a few performances I changed the concept a bit and removed the controls from the in-world instrument (only left the visual representations) and moved this functionality into a HUD. I had had a hard time during performances telling the audiences not to click the buttons all the time and not to stand between me and my instrument - something nobody deliberately did in order to annoy me, but because nobody is acquainted with an Onomatophone. Violins, Pianos and Guitars are well known and nobody dares to touch them without invitation, but this is not the case with an experimental instrument where it is not even obvious at first sight that this IS an instrument. In order not to make this a solo-piece for me, I extended the instrumentarium and created a special HUD for Miulew to do the vocal/solo role, so the general arc of tension for the whole song would not have to rely on me alone remote-controlling loops. The rest of the orchestra has HUDs to add percussive spice to the whole thing. composer: Björn Eriksson (aka miulew takahe), june 2007. The piece is a play with words “fragment”, “fragile”, “fragula” and “Dracula”. The visual part of this piece is made from small and big movements and animations of avatar while having the sound sack being colored in different colours. One of the major ideas about this piece is to have the orchestra to wander from a fragile and fragmented digital synthezised sound texture into a more analog acoustic and not so fragmented sound texture, and then come back to where it all started. This is aurally symbolized in the granulated synthezised sounds of sine waves, square waves and sawtooth shaped sounds. Also arpeggiated synthetic figures then gradually transforms into the sounds of an old harmonium with unprecise playing. There is also a transitional sound in between the digital and analog sound sources where a time stretched harmonium sounds gets this role. There is three groups of players in this piece as the different sounds forms chordal sound textures. Bingo Onomatopoeia/Andreas Müller made these programming of both sounds and animations for HUDs. This timbrally maximalist composition is an homage to all the composers throughout history that have either lived, worked or premiered any of their own compositions in Vienna. Structurally speaking, this composition can be seen as a hypermodernist and mechanistic "proof-of-concept" rather than a Romantic style composition with a clearly defined programmatic narrative with a Schenkarian tonal resolution hierarchy. The "real" Riesenrad is actually Vienna's largest family-sized Ferris Wheel and a familiar tourist attraction. In addition to virtual clasical instruments, the "modernists" have a special HUD interface where they can improvise using 24 recycled samples from various composers affiliated with Vienna. Another unique feature of this orchestral opus for Second Life is the fact that the composer/conductor is also responsible for producing classical drone/engine sounds from an exclusive HUD interface. 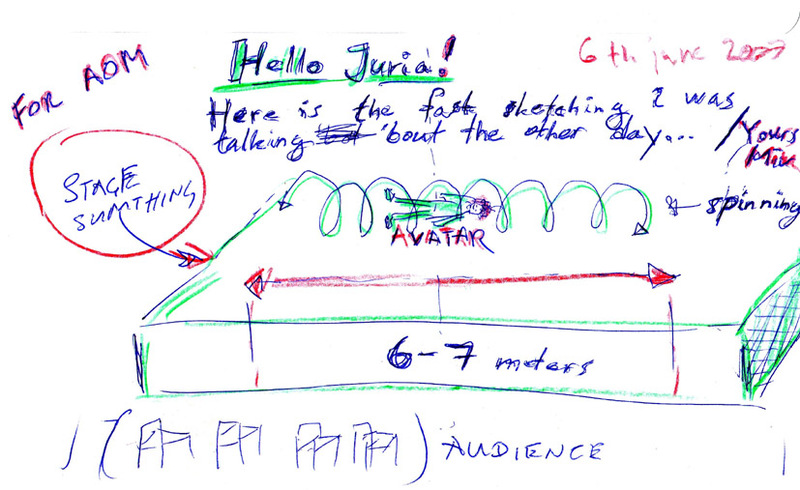 So in this sense, the composer/conductor is also a performer in realtime. 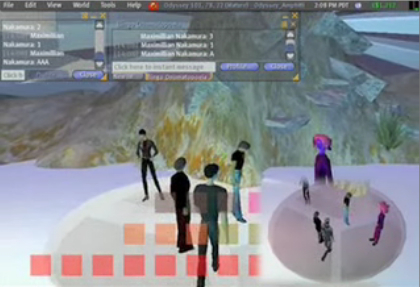 Avatars Brew is a composition made by Gumnosophistai for Avatar Orchestra Metaverse. Avatars Brew has a lose sonic framework losely based on 9 Beet Stretch, a massive soundscape made by augmenting Ludwig van Beethovens 9th Symphony to 24 hours (www.expandedfield.net). Within this frame each member of the orchestra will play with the framework and a dedicated choice of all other sources of sounds and animations available live through environment or inventory. The hint in the title to Miles Davis is to inspire the members to listen, improvise and rehearse on stage.